It had been a challenging morning. Elyn, our friend Anna, and I visited the traveling exhibit at the Museum of the History of the Jews in Girona. The photo exhibit, entitled “And I Still See Their Faces” (Y sigo viendo sus rostros), contains many early 20th-century photos of Polish Jews. The postcards, snapshots, and formal portraits are enlarged to nearly life size, giving you the impression that you are meeting these people eye to eye. The collection was gathered by the Shalom Foundation by making a world-wide appeal for photos of Polish Jews taken before the Holocaust. It is a lament for a lost world that can only be brought to life again via these ancient photos. We were in the remains of the Jewish quarter, from which the Girona Jews had been expelled in 1492, looking at photos of Polish Jews before they were expelled and massacred in World War II. At first, I was seeing the exhibit as interesting cultural history, noting details of costume, buildings, and signs. 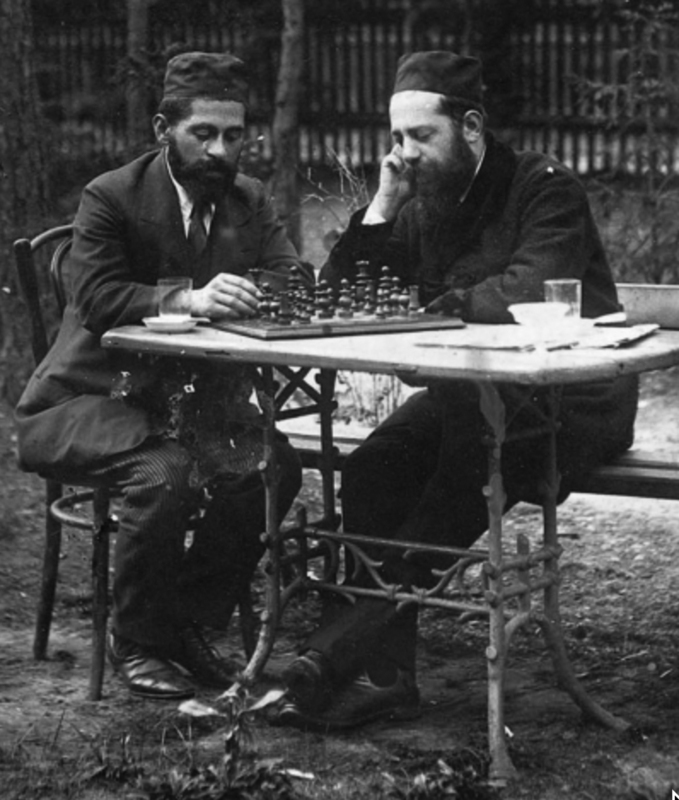 Two young men in traditional garb sat playing chess in a park. Families of several generations sat with the fixed expressions necessary for the slow exposure of early cameras. Soon, Elyn was feeling faint and woozy and left to get some fresh air. Then Anna saw her father’s home town on one of the labels and wondered aloud if she might be looking at unknown relatives. Elyn returned but had to leave again. I made my way through the exhibit to the back room where the photos took a grisly twist. I was viewing the rise of Nazism and the prisons and camps at Auschwitz, Treblinka, etc. The emotional intensity was rising and Anna had to leave the exhibit. I found her in the street outside with her face pressed against the medieval stone building, shattered by the experience. Elyn was also distressed even though she had viewed only part of the exhibit. We had planned to go on to the Garden of the Angels near the Archeology Museum, but I wondered whether we should just go home. But my companions wanted to go on, perhaps to shake off the dark memories of the photos we had just seen. We walked up the ancient Roman road that is now Calle de la Força past the cathedral and out the ancient Roman gate to the city. We happened upon a concert in progress in the decommissioned Church of St. Luke. This church serves as a store room for the replicas of Roman Legion armor that are worn in parades during Holy Week. We were greeted at the door by a young man who explained that they were singing in “Provençal.” “Oh, Catalonia North,” Elyn said. He smiled broadly and invited us in with a sweeping gesture. (Spanish Catalans refer to the area north of the Pyrenees as Catalonia Nord because it was once a part of the Catalan empire.) Elyn made a beeline for seats near the front. We were riveted by the clear voices of five young women standing in the apse (click on the icons to hear them). They sang with strong, nearly metallic voices that reminded me of Bulgarian women’s choirs. Several couples performed a graceful, stately dance along with the music. The women, who live in Girona, finished their part of the program and were joined by four male singers from Tarbes, north of Lourdes in France. The groups joined together for one song, and then the women exited, leaving the men to continue the concert. I was entranced by their singing, which matched the women in style and intensity. Two of the young women singers joined the audience, after picking up their babies from grandmothers or aunts. They began nursing the babies as the men sang and the dancers continued to dance. Now I began to see what this concert was all about. It was a show of solidarity between the Occitans of France and the Catalans of Spain. The languages, which are linguistically related to "Provençal,” are very close, and people who speak one version can understand the others. The men’s group was here in Girona to offer their support for the growing independence movement in Catalonia. It was like an extended family reunion with everyone enjoying each other’s company. I was struck by how these people have maintained their cultural identity through all the trials of European fascism in the 20th century, the Spanish dictator Franco’s attempts to wipe the Catalan language and culture off the face of the earth, and the current attempts by the central government of Spain to control their bid for independence. The images from the Polish exhibit floated back to me, but the good humor and joy of the people around me gave me hope for the ultimate triumph of this human enterprise we all share. The image of a young boy who came up and kissed his baby brother as he was being nursed by their mother said it all for me. Pure love in the midst of turmoil and hate. I left the concert renewed and refreshed, after purchasing three CDs of music of Capcadira (the women) and Vox Bigerri (the men). The past is alive on many levels here in Girona, and we have a rich—and sometimes searing—experience of it.